The second in the series organized around common FAQs, "40 Questions about Interpreting the Bible" tackles the major questions that students, pastors and professors ask about the hermeneutics of reading the bible (i.e. understanding the bible). This is a constant field of study by professor and student alike which empowers the pastor to teach with confidence. Robert Plummer parses the discussion into four parts: getting started, approaching the bible generally, approaching specific texts, and issues in recent discussion. In each section the forty questions lead each exploration. This allows teachers to embrace this book as a textbook and the curious student to engage the book on a pick and choose basis to discover what issues are most pertinent to their study. Sure to be a happy tool for the professor "40 Questions About Interpreting the Bible" will be essential reading for the student seeking to advance expertly in his biblical studies. 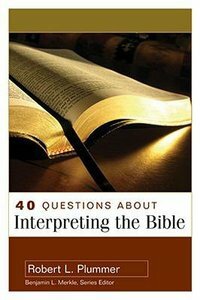 About "About Interpreting the Bible (40 Questions Series)"
This book is intended to help you understand the Bible. As a New Testament professor, I regularly teach an introductory course on biblical hermeneutics (interpretation) at The Southern Baptist Theological Seminary in Louisville, Kentucky. I have had difficulty finding a textbook that covers briefly and accurately all the issues that we survey in that course. (Topics covered in my course include: canon, manuscript transmission, English Bible translations, general interpretive questions, approaches to the major literary types in the Bible, and current hermeneutical debates.) I wrote this book in order to address these issues in one volume. Ideally, this book will serve as a textbook for an introductory Bible course at a college or seminary, but I endeavored to write so that the book will be beneficial to any curious Christian. My goal was to be accessible without being simplictic and scholarly without being pedantic, while always keeping an eye to practical questions and real-life application by the Christian reader. This volume by Dr Thomas R. Schreiner on the interplay between Christianity and biblical law is an excellent addition to the 40 Questions and Answers series. Schreiner not only coherently answers the tough questions that flow from a discussion about the Old Testament Levitical Law, but also writes clearly and engagingly for the student. The pastor, student, and layperson can easily understand Schreiner's biblical theology of the Law.